Cultural identity and the mingling of different races mark Sicily both present and past. After generations of intermingling, the island has become the center of the Mediterranean diet, combining a heritage built on customs, rituals, hospitality, production techniques and, obviously, recipes. Sicilian gastronomy is inextricably linked to the presence of Siculians, Phoenicians, Byzantines, Greeks, Romans, Carthaginians, Arabs, the French, the Spanish, and many, many others. Several of its most famous dishes are the product of this historical medley of peoples and ethnicities. 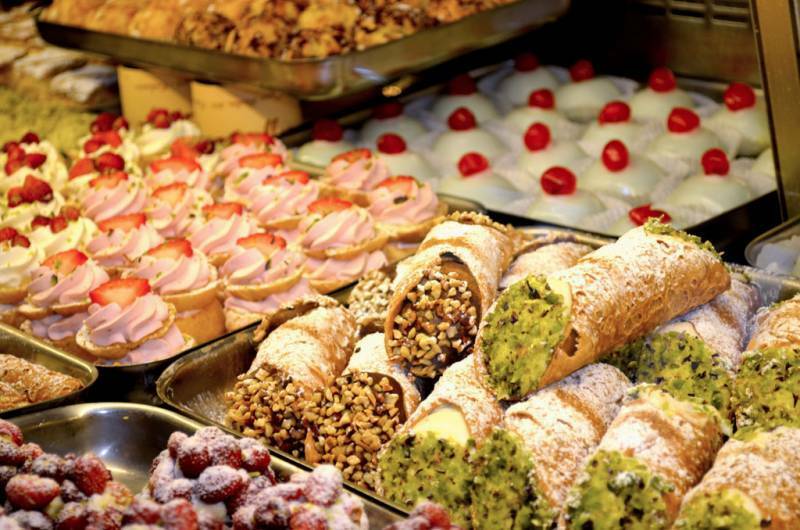 Here are just some of the dishes you must try should you find yourself traveling to Sicily. The origins of this world- renowned dessert stretch back to Arab rule between the 9th and 11th centuries, which saw the introduction of cane sugar, lemons, bitter orange, citron, mandarins and almonds. Combined with sheep’s-milk ricotta—a traditional local product—these new foodstuffs gave rise to the first cassata. 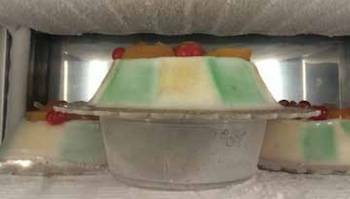 Originally, cassata was made with stuffed pastry dough and baked in an oven. During the Norman period, pastry dough was replaced with a dough made with almond flour and sugar. Rather than baked, it was served cold. The Spanish later introduced chocolate from their colonies in South America. The Baroque era added the final touch: candied fruit. Today you can find several variations of cassata, with pistachios, pine nuts, cinnamon, maraschino cherries or orange blossom water. Around Palermo, you can still find baked cassata. The name refers to the river canes around which the dough used to be rolled. There are those who contend that the name goes back to Cicero, who was the Quaestor of Lilybaeum (now Marsala) from 76 to 75 B.C., but what appears indisputable is that the dessert was first created in the town of Caltanissetta. 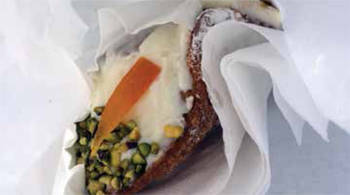 For some people, cannolo was invented by nuns living in a cloistered convent, who began with the ancient Roman recipe later developed by the Arabs. For others, it was invented by a group of women in a harem run by a local Arab, and its characteristic shape is a vaguely phallic symbol. Whatever the case, the dessert owes its fame to the pastry shops in Palermo and Messina, who are also responsible for the dark cream filling variation, made with ricotta and chocolate. The traditional white stuffing is made with sifted and sugared sheep’s-milk ricotta. Candied fruit or chocolate can be added later. Finally, the dessert is dusted with powdered sugar. Scattered throughout the Mediterranean, this traditional vegetable dish in a sweet-and- sour sauce is today generally served as a side dish or appetizer. However, it was originally an entrée served with bread. The basic ingredients are eggplant, green or white olives, onions, celery, capers, tomatoes, oil, salt, vinegar and sugar. 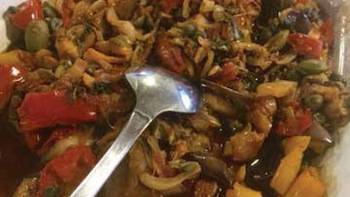 One popular theory suggests the word ‘caponata’ comes from ‘capone,’ the name in some parts of Sicily for mahi-mahi, a type of fish consumed by the aristocracy in a sweet-and-sour sauce. Unable to afford such an expensive fish, the masses substituted it with the more reasonably priced eggplant. And that is the recipe that has come down to us today. Immigration is to thank for caponata’s global fame. At the end of the 19th century, an old canning industry family from Palermo began producing caponata on an industrial scale, conserving it in handmade tin cans and shipping it abroad, primarily to the United States, where Sicilian immigrants were hankering for the taste of home. Some variations call for basil and toasted pine nuts and almonds, but if you’re traveling between Messina, Catania, Agrigento and Palermo, you can taste various versions of the dish. Each variation is linked to the history and tradition of its respective city.